HIV-infected patients exhibit quantitative and qualitative defects in CD4 T cells, including having increased numbers of CD4+CD45R0+/CD45RA+ T cells, although it remains unclear how these cells arise. Here we demonstrate that gp120 treatment of activated but not resting primary human CD4 T cells decreases number of cells with single positive CD45R0+/CD45RA- effector memory phenotype while proportionally increasing the subset of cells with double positive CD45R0+/CD45RA+ mixed phenotype. We found that double positive CD45R0+/CD45RA+CD4 T cells preferentially undergo apoptosis while single positive CD45R0+/CD45RA- and CD45R0-/CD45RA+ do not. Blocking gp120-CD4 interaction with sCD4 or inhibition Lck activity reverses gp120 induced increase in double positive CD45R0+/CD45RA+CD4 T cells and subsequently diminishes the apoptosis of double positive CD45R0+/CD45RA+ cells. Altogether these data indicate that gp120 ligation of the CD4 receptor increases the number of double positive CD45R0+/CD45RA+ CD4 T cells which subsequently undergo apoptosis in a CD4 dependent manner. One hallmark of HIV pathogenesis is a decline of CD4 T cell number that results from the death of both HIV-1 infected CD4 T cells, as well as uninfected cells. Both HIV expressed proteins, as well as immune activation, contribute to this T cell death . Immune activation leads to an increase in T cell turnover from enhanced proliferation which in turn is associated with high rates of apoptosis [2, 3]. The magnitude of immune activation correlates with the level of HIV viremia . Increased expression of immune activation markers (HLA-DR+, CD38+, CD45RO+, and CD95) also correlates with higher apoptosis rates of CD4 T cells . Importantly, suppression of viral replication with HAART treatment reduces immune activation [6, 7], normalizes expression of activation markers, and decreases CD4 T cell apoptosis [8-10]. As a result of chronic immune activation, central memory and naïve CD4 T cells are constantly recruited into the effector pool [11, 12] resulting in dramatic changes in populations of naïve, effector and central memory CD4 T cells . The mechanisms of how the ratio of these CD4 T cells is altered during HIV infection are not completely understood. In particular, chronic HIV infection results in an increased number of CD4 T cells with a peculiar double positive CD45RO+/CD45RA+/CD25+CD4+ phenotype, and this subset is further increased following intermittent IL-2 therapy . The origin of this subset was previously ascribed to be transition phase of naïve CD45RO-/CD45RA+CD4 T cells transitioning to a memory CD45RO+/CD45RA-CD4 T cell phenotype . Furthermore, HAART with IL-2 therapy selectively increases the number of activated CD4 T cell expressing CD45RO+/CD25+ . Here we describe a novel effect of HIV-1 gp120 signaling through CD4 resulting in altered CD45 isoform expression by CD4 T cells. This protocol was reviewed and approved by the Mayo institutional review board. CD4+ T cells were isolated from the blood of healthy volunteer blood donors by using RossetteSep CD4 enrichment cocktail (StemCell Technologies, Vancouver, British Columbia, Canada), producing 98% pure CD4+ T cells as determined by flow cytometry. CD4 T cells were maintained in RPMI 1640 supplemented with 10% fetal bovine serum (Invitrogen, Carlsbad, CA), 2 mM L-glutamine, and antibiotics (penicillin 100 U/ml, streptomycin 100 μg/ml) at 0.5x106 cells/ml. CD4+ T cells used in the various experiments were stimulated with PHA (1 μg/ml) for 24 hours, and then cells were washed twice with RPMI 1640 and maintained in media supplemented with 50 U/ml of IL-2 for 48-72 hours. CD4 T cells were incubated with HIV-1 X4 gp120IIIB (Immuno Diagnostics, Inc. Woburn, MA) or gp120 IIIB pretreated with soluble CD4 (1:2 ratio) (Immuno Diagnostics, Inc. Woburn, MA) at concentrations of 1 μg/ml/2x106 cells for 24 hours at 37°C. AMD3100 (NIH AIDS Research and Reference program) was used at 2 μM for 30 minutes at 37°C. PP2 was purchased from CalBiochem (La Jolla, CA). Anti-CD4-PE, anti-CD25-FITC, anti-CD69-PE, anti-CD4PerCP, anti-CD62L-PE, anti-CD45RO-FITC, anti-CD45RA-PE-Cy-7, anti-HLA-DR-PE, AnnexinV-Cy-5, AnnexinV-APC, IgG1κ-PE-Cy7, IgG2a-FITC, IgG1κ-PE and propidium iodine were purchased from BD Biosciences (San Jose, CA). CD4 T cells were untreated or pre-incubated with specific inhibitors and stimulated with either BSA or with soluble gp120IIIB (10μg/ml) overnight. The following day, cell death was analyzed by staining with AnnexinV-Cy-5 and propidium iodine following the manufacturer’s instructions from BD Biosciences (San Jose, CA). All experiments were performed at least three times. T cell phenotyping studies were performed by using four-color Flow analysis on FACSCanto cytometer and using FACSDiva 6.0 software. Briefly, 2x106 cells were resuspended in 200μl of PBS+0.5%BSA, stained with the indicated primary conjugated antibodies for 20 minutes (anti-CD45RO-FITC, anti-CD45RA-PE-Cy-7, anti-CD27 APC and anti-CD62L-PE), washed, fixed and then analyzed. In some cases, for analysis of cell death, cells were stained in binding buffer (140 mM NaCl, 10 mM HEPES/NaOH (pH 7.4), 2.5 mM CaCl2) as described above except that anti-CD62L-PE was substituted with AnnexinV-PE. We and others have previously demonstrated that gp120 induces death of resting CD4 T cell in a CXCR4-p38 dependent manner . However, the effect of gp120 on activated CD4 T cells is largely unknown. To examine the effect of gp120, resting (CD4+CD25-CD69-HLA-DR-) and activated (CD4+ CD25+CD69+HLA-DR+) primary human CD4 T cells were treated with gp120 IIIB (10μg/ml) for 24 hours and then CD4 T cells were analyzed for CD45R0 and CD45RA expression by flow cytometry. As shown in Fig. (1A), gp120 treatment results in a 50% decrease in the subset of single positive CD45R0+/CD45RA- (31.85 ± 0.63% with BSA, 13.80 ± 3.73% with gp120, p=0.01) memory cells when activated but not resting CD4 T cells are treated with gp120 (34.25 ± 1.1% with BSA, 28.95 ± 1.96% with gp120, p=0.08). In parallel, there is a proportional increase in the subset of double positive CD45R0+/CD45RA+ mixed phenotype CD4+ T cells (Fig. 1B) as well as an increase in the proportion of Annexin-V positive CD4 T cells (Fig. 1C). While the increased apoptosis of resting cells following gp120 is due to CXCR4 signaling , the mechanisms by which gp120 causes death in activated cells are unknown. 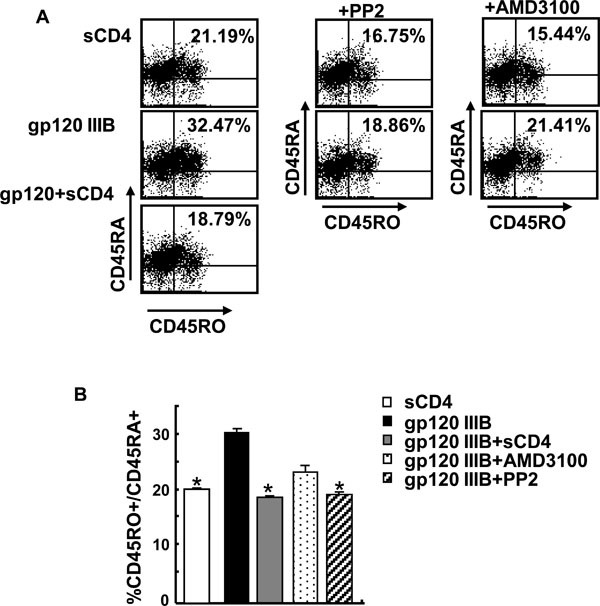 Gp120 decreases CD45RO+/CD45RA- memory phenotype in activated but not resting primary human CD4 T cells. (A and B) CD4+ T cells (98% pure) were stimulated with PHA for 24 hours or left rested, and treated with either p120 (IIIB) (1µg/ml) or BSA control (1µg/ml) and analyzed for CD45RO and CD45RA (gated on CD4 population) by flow cytometry. (C) Resting and activated primary human CD4 T cells were treated with gp120 (IIIB) as above and analyzed for Annexin-V positive cells. Data is representative of three independent experiments. Gp120 increases subset of CD27+/CD45RO+/CD4+ T cells. (A) Activated primary human CD4 T cells (98% pure) were treated with gp120 IIIIB and the expression of CD27 and CD45RA were analyzed by flow cytometry. (B) Pooled data from three independent experiments. P values were determined by Student’s paired t test. 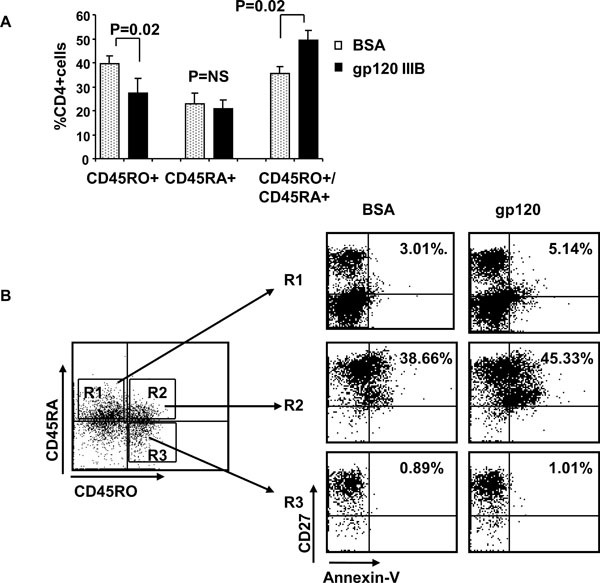 Gp120 increases subset of double positive CD45RA+/CD45RO+ CD4 T cells that undergo apoptosis. (A) Activated primary human CD4 T cells were treated with gp120 IIIIB and CD45RA+/CD45RO-, CD45RA-/CD45RO+ and double positive CD45RA+/CD45RO+ cells were quantified by flow cytometry. (B) Same as Fig. (3A) except that CD27 expression and Annexin-V positivity were measured by four color flow cytometry. The data is representative of three independent experiments. CD4 and Lck are required for gp120 mediated increase of double positive CD45RA+/CD45RO+ CD4 T cells. (A) Activated primary human CD4 T cells were left untreated or were pre-treated with either Lck inhibitor, PP2 (5µM) or CXCR4 inhibitor, AMD3100 (2µM) or sCD4 (2µg/ml) followed by gp120. Then number of single positive CD45RA+/CD45RO-, CD45RA-/CD45RO+ and double positive CD45RA+/CD45RO+ cells were analyzed by flow cytometry. (B) The data represents three independent experiments as described above. P values were determined by Student’s paired t test. *=P<0.05 compared to gp120 alone. The finding that gp120 treatment of activated cells increases the lymphoid homing marker, CD27 (13.8% of total CD4 T cells) preferentially in double positive CD45R0+/CD45RA+ cells suggests that these cells might be the specific cell type which dies following gp120 treatment of activated CD4 T cells (Fig. 2A, B). We therefore measured absolute number and proportion of Annexin-V positivity of double positive CD45R0+/CD45RA+, single positive CD45R0-/CD45RA+ and CD45R0+/CD45RA- subsets by using four color flow cytometry analysis. First we observed that CD45RO+RA- proportion decreased (39.42 ± 3.44% with BSA, 27.31 ± 6.38% with gp120) while CD45RO+RA+ population increased (35.97 ± 2.70% with BSA, 49.42 ± 10.05% with gp120), suggesting that the former transitioned to the latter (Fig. 3A). Next we observed that only double positive CD45R0+/CD45RA+ CD4 T cell subset contain a significant proportion of Annexin positive cells (~40%) in contrast to single positive CD45R0+/CD45RA- and CD45R0-/CD45RA+ subsets that do not (Fig. 3B). Therefore, gp120 signaling both activates cells towards a double positive phenotype and subsequently promotes their apoptotic death. Of interest, these Annexin positive CD45R0+/CD45 RA+ cells are also CD27+. Altogether these results indicate that gp120 treatment of activated CD4 T cells result in decrease memory CD45R0+/CD45RA- CD4 T cells due to accumulation of CD45R0+/CD45RA+ /CD27+ T cell subset that subsequently and selectively undergo apoptosis. To investigate whether gp120 effect on CD45R0+/CD45RA+ CD4 T cell is due to ligation to CD4 or CXCR4, we used either soluble CD4 or the CXCR4 inhibitor, AMD3100. Independent experiments verified the activity of AMD3100 by blocking SDF-induced chemotaxis (data not shown). As shown in Fig. (4A, B), inhibition of CD4 ligation by sCD4  blocks the increase in double positive CD45R0+/CD45RA+ memory cells. Consistent with this observation, inhibition of Lck activity with PP2 inhibitor also blocks increase in CD45R0+/CD45RA+ CD4 T cell subset. Conversely inhibition of gp120-CXCR4 interaction with AMD3100  does not block completely gp120 mediated increase of CD45R0+/CD45RA+ CD4 T cells. Therefore, our results demonstrate that gp120 ligation to CD4 and subsequent activation of Lck results in accumulation of double positive CD45R0+/CD45RA+ memory CD4 T cells which subsequently and selectively undergo apoptosis in a CD4 dependent and CXCR4 independent manner. In the current report we have shown that gp120 treatment of activated CD4 T cells decreases the subset of single positive CD45R0+/CD45RA- CD4 T cells and increases the subset of double positive CD45R0+/CD45RA+ CD4 T cells which selectively undergo apoptosis. These results imply the gp120 may play a role in depletion of memory CD45R0+/ CD45RA- CD4 T during HIV. Previously, the CD45R0+/CD45RA+ subset of CD4 T cells was characterized as a transition from naïve to effector phenotype during CD4 priming [15, 18] with increased expression of activation markers [19, 20]. The generation of this subset can occur in two ways: (i) the transition of recently activated of CD45RA+ T naïve cells to CD45R0+/ CD45RA+ phenotype [15, 21] and; (ii) re-expression of CD45RA isoform in the absence of Ag stimulation . The fact that only few CD45R0+/CD45RA+ cells express markers of recently activated cells [19, 20] and upregulation of CD45RA+ (up to 10%) by CD45RO+/CD45RA- cells  suggest that gp120 rather upregulates CD45RA+ on single positive CD45RO+/CD45RA- memory CD4 T cells rather than promoting CD45RO expression on naïve CD4 T cells. Indeed, increase of double positive CD45RO+/CD45 RA+ CD4 T cells is followed by proportional decrease in CD45RO+/CD45RA- memory but not decrease in naïve CD45RO-/CD45RA+ CD4 T cells. Others have shown that PBMC stimulated with staphylococcal enterotoxin A (SEA) in the presence of V3-derived gp120 peptides results in increase of CCR5+/CXCR4+/ CD45RO+ CD4 T cells followed by increased levels of apoptosis . Our findings are in good agreement with this observation: first, both results demonstrate the gp120 mediated increase in transient state from naïve to activated CD4 T cells; second, both studies observe the increased apoptosis of activated CD4 T cells in the presence of gp120 or V3-derived peptide. 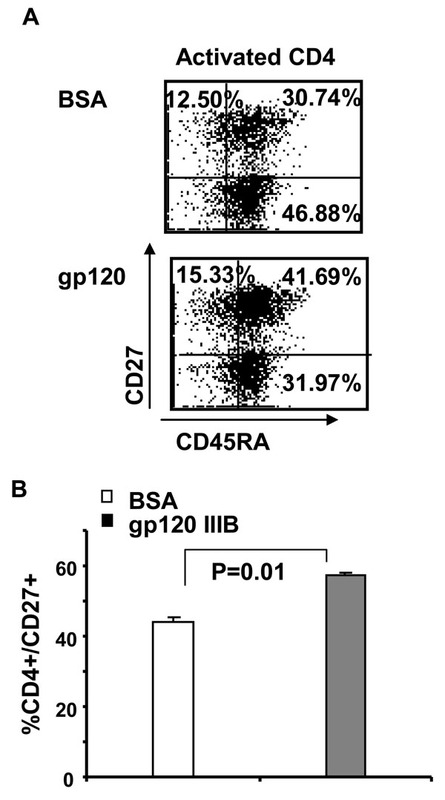 However, our results highlight that gp120 priming of previously activated CD4 T cells reverses single positive CD45RO+/CD45RA- effector phenotype to double positive CD45RO+ /CD45RA+ transient phenotype. The observation that double positive CD45R0+/CD45 RA+ preferentially undergo apoptosis presents one potential scenario of how inappropriately activated CD4 T cells die during HIV disease, and why IL-2 augments this process . It is of further interest that gp120 treatment results in apoptosis of CD27+/CD45R0+/CD45RA+ cells. In fact, CD27 expression is rapidly upregulated following TCR stimulation  and CD27 signaling is essential for survival of Ag-primed CD4 T cells . Therefore, either the lack of antigen specific signaling or the lack of CD27 signaling may explain the increased apoptosis of double positive CD45R0+/CD45RA+ following gp120 treatment. Finally, the observation that CD4 ligation by gp120 and subsequent activation of Lck is required for generation of double positive CD45R0+/CD45RA+ CD4 T cells is of relevance and suggests that inhibitors of CD4-gp120 interactions may reverse the expansion of double positive CD45R0+/CD45RA+ population and subsequent increased apoptosis during HIV infection. Dr. Andrew Badley is supported by the following grants: NIH R01 AI62261, R01 AI40384 and a Burroughs Wellcome Award ID #1005160. Lum J, Badley AD. Cell Death During HIV Infection. Boca Raton: Taylor and Francis Press 2006; pp. 109-26. Douek DC, Betts MR, Hill BJ, et al. Evidence for increased T cell turnover and decreased thymic output in HIV infection J Immunol 2001; 167: 6663-8. Hellerstein M, Hanley MB, Cesar D, et al. Directly measured kinetics of circulating T lymphocytes in normal and HIV-1-infected humans Nat Med 1999; 5: 83-9. Perelson AS, Neumann AU, Markowitz M, Leonard JM, Ho DD. HIV-1 dynamics in vivo: virion clearance rate, infected cell life-span, and viral generation time Science 1996; 271: 1582-6. Gougeon ML, Lecoeur H, Dulioust A, et al. Programmed cell death in peripheral lymphocytes from HIV-infected persons: increased susceptibility to apoptosis of CD4 and CD8 T cells correlates with lymphocyte activation and with disease progression J Immunol 1996; 156: 3509-20. Hazenberg MD, Stuart JW, Otto SA, et al. T-cell division in human immunodeficiency virus (HIV)-1 infection is mainly due to immune activation: a longitudinal analysis in patients before and during highly active antiretroviral therapy (HAART) Blood 2000; 95: 249-55. Lempicki RA, Kovacs JA, Baseler MW, et al. Impact of HIV-1 infection and highly active antiretroviral therapy on the kinetics of CD4+ and CD8+ T cell turnover in HIV-infected patients Proc Natl Acad Sci USA 2000; 97: 13778-83. Badley AD, Dockrell DH, Algeciras A, et al. In vivo analysis of Fas/FasL interactions in HIV-infected patients J Clin Invest 1998; 102: 79-87. Bohler T, Walcher J, Holzl-Wenig G, et al. Early effects of antiretroviral combination therapy on activation, apoptosis and regeneration of T cells in HIV-1-infected children and adolescents AIDS 1999; 13: 779-89. Giorgi JV, Majchrowicz MA, Johnson TD, Hultin P, Matud J, Detels R. Immunologic effects of combined protease inhibitor and reverse transcriptase inhibitor therapy in previously treated chronic HIV-1 infection AIDS 1998; 12: 1833-44. Hazenberg MD, Hamann D, Schuitemaker H, Miedema F. T cell depletion in HIV-1 infection: how CD4+ T cells go out of stock Nat Immunol 2000; 1: 285-9. Silvestri G, Feinberg MB. Turnover of lymphocytes and conceptual paradigms in HIV infection J Clin Invest 2003; 112: 821-4. McCune JM. The dynamics of CD4+ T-cell depletion in HIV disease Nature 2001; 410: 974-. Sereti I, Martinez-Wilson H, Metcalf JA, et al. Long-term effects of intermittent interleukin 2 therapy in patients with HIV infection: characterization of a novel subset of CD4(+)/CD25(+) T cells Blood 2002; 100: 2159-67. Hamann D, Baars PA, Hooibrink B, van Lier RW. Heterogeneity of the human CD4+ T-cell population: two distinct CD4+ T-cell subsets characterized by coexpression of CD45RA and CD45RO isoforms Blood 1996; 88: 3513-21. Sereti I, Herpin B, Metcalf JA, et al. CD4 T cell expansions are associated with increased apoptosis rates of T lymphocytes during IL-2 cycles in HIV infected patients AIDS 2001; 15: 1765-75. Trushin SA, Algeciras-Schimnich A, Vlahakis SR, et al. 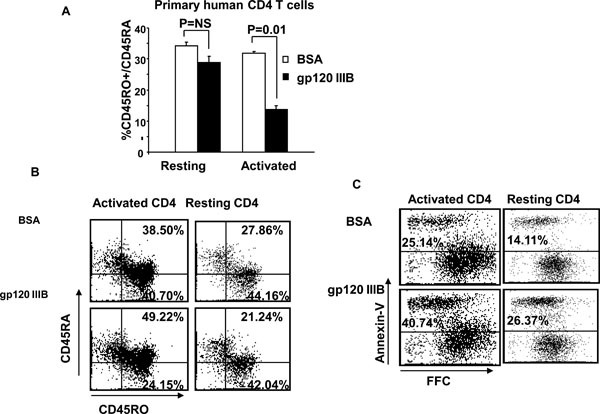 Glycoprotein 120 binding to CXCR4 causes p38-dependent primary T cell death that is facilitated by, but does not require cell-associated CD4 J Immunol 2007; 178: 4846-53. Picker LJ, Treer JR, Ferguson-Darnell B, Collins PA, Buck D, Terstappen LW. Control of lymphocyte recirculation in man. I. Differential regulation of the peripheral lymph node homing receptor L-selectin on T cells during the virgin to memory cell transition J Immunol 1993; 150: 1105-21. Baars PA, Maurice MM, Rep M, Hooibrink B, van Lier RA. Heterogeneity of the circulating human CD4+ T cell population. Further evidence that the CD4+CD45RA-CD27- T cell subset contains specialized primed T cells J Immunol 1995; 154: 17-25. Prince HE, York J, Jensen ER. Phenotypic comparison of the three populations of human lymphocytes defined by CD45RO and CD45RA expression Cell Immunol 1992; 145: 254-62. Wallace DL, Beverley PC. Phenotypic changes associated with activation of CD45RA+ and CD45RO+ T cells Immunology 1990; 69: 460-7. Porichis F, Vlata Z, Hatzidakis G, Spandidos DA, Krambovitis E. HIV-1 gp120/V3-derived epitopes promote activation-induced cell death to superantigen-stimulated CD4+/CD45RO+ T cells Immunol Lett 2007; 108: 97-102. Watts TH. TNF/TNFR family members in costimulation of T cell responses Annu Rev Immunol 2005; 23: 23-68. Hendriks J, Xiao Y, Borst J. CD27 promotes survival of activated T cells and complements CD28 in generation and establishment of the effector T cell pool J Exp Med 2003; 198: 1369-80.